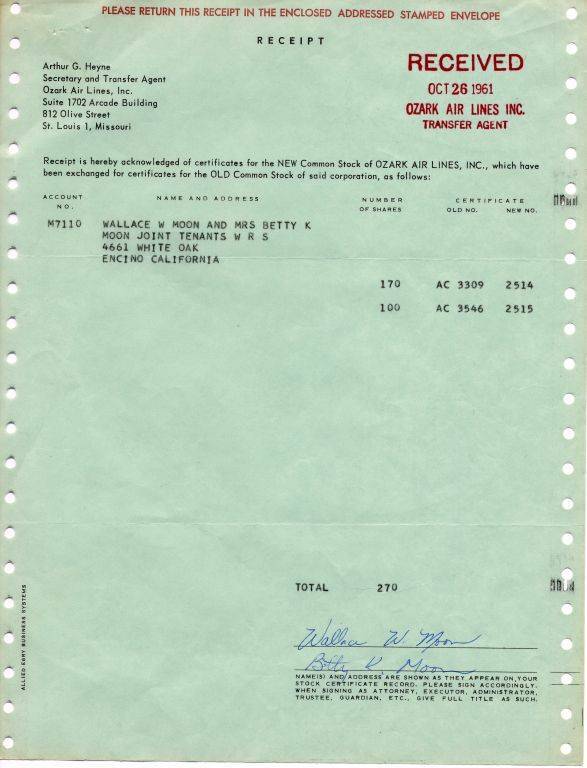 Beautiful certificate from the Ozark Air Lines, Inc. issued in 1959. This historic document and has an ornate border around it with the company's name on top center. This item has the original signatures of the Company's President, Laddie Hamilton and Secretary, and is over 59 years old. Signature Wallace Wade Moon was an American professional baseball outfielder in Major League Baseball. Moon played his 12-year career in the major leagues for the St. Louis Cardinals and Los Angeles Dodgers. He batted left-handed and threw right-handed. Moon was the 1954 National League Rookie of the Year. 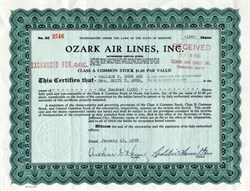 Ozark Air Lines operated in the United States from 1950 until 1986 when it was purchased by Trans World Airlines (TWA). A smaller regional airline which used the Ozark name (and whose operating certificate was purchased by Great Plains Airlines) operated in 2000�2001. From 1950 until 1986 Ozark's headquarters was at Lambert�St. Louis International Airport in St. Louis County, Missouri.